One of the (not a few) pleasures of working in a university is the occasional opportunity that arises to give a new lecture course to students. New is not quite the correct word, since the topic I have acquired is Conformational analysis. The original course at Imperial College was delivered by Derek Barton himself about 50 years ago (for articles written by him on the topic, see DOI 10.1126/science.169.3945.539 or the original 10.1039/QR9561000044), and so I have had an opportunity to see how the topic has evolved since then, and perhaps apply some quantitative quantum mechanical interpretations unavailable to Barton himself. The example I have chosen to focus on here is biphenyl (a derivative of which also happens to be the first structure shown by Barton in his 1970 Science article noted above), but modified with iso-electronic B/N substitution for carbon for a particular reason. Four hydrogen atoms are highlighted in the above drawings by virtue of how close they might approach each-other, and what impact this will have on the conformation of each species. Such close approaches are normally defined with reference to the so-called van der Waals radius of the element concerned. For hydrogen, this radius is either 1.2Å (if the contact is to another hydrogen) or 1.1Å (if its to any other element, see DOI: 10.1021/jp8111556). An interpretation of this value is that the van der Waals attraction due to to dispersion or long range correlation effects reaches a maximum for two non-bonded hydrogen atoms at ~2.4Å. Significantly, a slightly closer approach than this value might still be mildly attractive, but it would be generally agreed that any distance less than ~2.1Å now represents a genuine repulsion between the hydrogens (see also this post). This represents a somewhat more quantitative judgement on what used to be called steric interactions. One can see here minima at ~45, 135, 225 and 315° for 1 (see DOI 10042/to-4853). Due to symmetry, the first and last are identical as are 2nd and 3rd, and the 1st and 2nd minima are in fact enantiomers of each other (the symmetry is D2, which is chiral). Two different transition states connect these minima, one with angles of 0/180 and the other slightly lower energy at 90/270°. The non-bonded H…H distance are as follows: 1.95Å@0°, 2.39Å@45° and 3.54Å@90°. We may conclude that the first of these is repulsive, the second attractive and the third non interacting. Counterbalancing this effect is of course resonance due to π-π-overlaps across the central bond, which decreases to zero as the angle moves to 90°. The conformational minimum @45° is such because of the maximal H…H dispersion attraction and the still significant π-π-overlap. This brief analysis suggests however that these two effects are finely balanced, and so the next question is whether one might be able to perturb the system to distort the balance. The perturbation chosen is to replace one or two pairs of carbon atoms with the iso-electronic combination B+N. 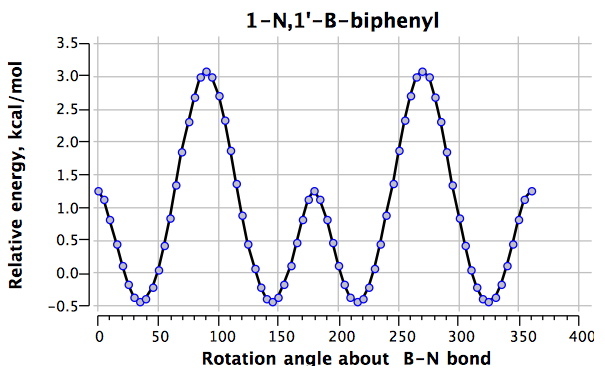 The first perturbation is to replace the central rotating bond by a B-N combination 2 (DOI: 10042/to-4854). The next perturbation is to relocate the N/B pair as in 3 (DOI: 10042/to-4855). If one imagines that this will be a minor perturbation, take a look at the profile below. Rotation about central C-C bond in 3. The world has been turned upside down. What were transition states @0° and @180° are now minima and the reason is easy to find. 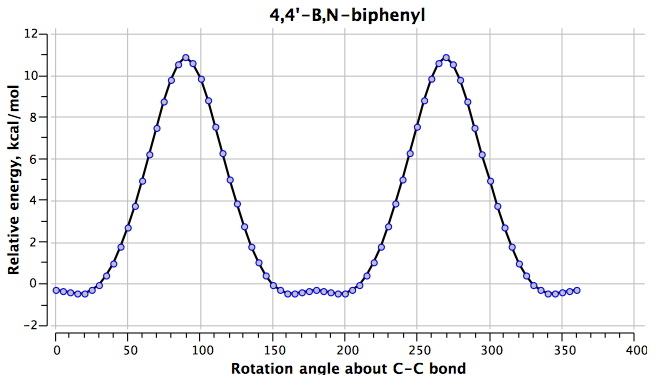 The central C-C bond is now only 1.400Å long, having acquired substantial double bond character, and being accordingly very much more difficult to twist (the barrier being ~30 kcal/mol). The π-π-overlap has won out completely, and in the process has forced the H…H distance down to a presumably repulsive 1.918Å. The penalty for this is that the overall energy of 3 is some 22.8 kcal/mol higher than 2. Added in proof (as the expression goes): If the above profile is conducted with full geometry optimization in a solvent field (water), which helps stabilise charge separations, the profile changes to the below. The solvation reduces the barrier to rotation considerably, the energy maxima now reveal a proper stationary point (rather than the cusp), the minima are very slightly non-planar, but the basic inversion of the potential energy surface compared to 1 or 2 is still observed. 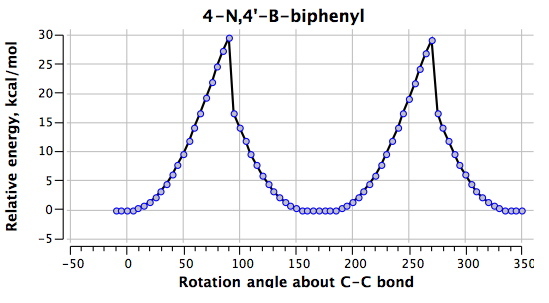 Rotation about the central C-C bond in 4. The H…H distances are 1.930Å@0°, 1.789/2.275Å@180°. The difference from 1 is that the hydrogens now have opposite polarity for the N-H (which is positive) and the B-H (which is negative). At the rotation angle of 0°, two H(+)…(-)H style dihydrogen bonds (see also this post) are established (these are presumed to be very attractive); at an angle of 180°, the H(+)…(+)H and H(-)…(-)H interactions are presumed to be very repulsive. The difference between the two is ~18 kcal/mol. We have learnt that conformational analysis for molecules such as these is a fight between π-π-overlaps, which themselves can have unexpected outcomes, weak van der Waals dispersion interactions between “neutral” non-bonded hydrogen atoms, and strong electrostatic attractions and repulsions between “ionic” hydrogens. Now perhaps the reason for the choice of the wB97XD DFT method can be seen; it is capable (at least in theory) of balancing these forces properly. So the world of conformational analysis can be turned upside down, and analysing what happens from this topsy-turvy viewpoint can teach a lot! This entry was posted on Friday, April 2nd, 2010 at 4:46 pm and is filed under Interesting chemistry. You can follow any responses to this entry through the RSS 2.0 feed. You can leave a response, or trackback from your own site. Why is the energy profile for the energy barriers for bifenyl 3 assymetric? Is this a calculation artifact, or does it really a difference in rotation direction? It is indeed asymmetric. To explain, I have to add detail to how the energy profile was obtained. It is done by defining a dihedral angle covering the central bond, and then incrementing in small steps until a full rotation has been done (this is often called dihedral driving). If this dihedral angle is a good approximation to the actual reaction coordinate (defined as the vectors for the single negative force constant characterising the saddle point representing the transition state), then the plot will be smooth and continuous. 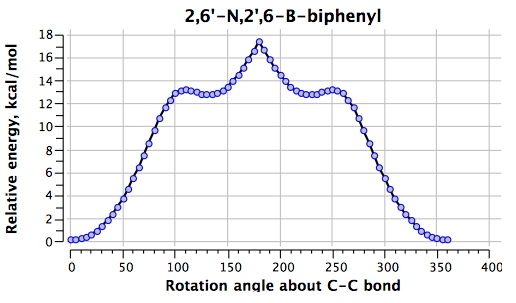 For the example quoted, as the dihedral approaches 90°, the aryl groups themselves start becoming non-planar and the dihedral torsion angle becomes less and less accurate as a reflection of the actual reaction coordinate. This eventually will lead to the hysteresis evident in the plot. A famous example of this is the gas phase Sn2 reaction using just one bond length to describe. Close to the transition state there, tiny changes in that bond length induce large changes in the other bond, and again the system shows asymmetry. The solution would be to try to pick a better coordinate to describe the reaction coordinate. In the case of biphenyl, its difficult to see what that would be. What one can say is that the actual transition state is probably higher than the top of the curve, ie the rotational barrier is a lower limit. If fact, if one took the geometry at the top of the cusp, and subjected it to a full optimisation using the Hessian to direct it, one probably would find the proper transition state without too much problem. One might then use the Hessian calculated at that proper transition state to derive an IRC downhill to regenerate the reaction profile. But that is a fair bit of work, and in this example, one probably would not learn much more from it. As for the request to see the inputs, that is all archived at the DOI quoted for each calculation, and anyone can acquire not only the input but also the output for themselves. Added in proof: If the potential for 3 is recalculated with application of a solvent field (water), the discontinuous behaviour is removed. Rotating a double bond in the gas phase may not be adequately described by a closed shell method (some biradical character may be involved), but applying a solvation correction allows zwitterions to form, which are properly described by a closed shell method. Your profiles in 3 and 4 show cusps that I have seen when generating rotational profiles without ensuring adherence to a single PES. Can you please describe (or post inputs as you have in the past for) how you are generating the data points, i.e. just guess structures or a LST-type profile? Are there crystal structures (or NMR data) for all these structures that confirm the calculations? Compound 2 has a crystal structure, which shows the system to be twisted by about 45°, as implied by the calculated potential. Compounds 3 and 4 are unknown. I have calibrated the ωB97XD/6-31G(d,p) method against a number of known conformations whilst preparing the lecture course, and find it extremely good at predicting accurate rotation barriers, both small and large. It is well worth exploring this Head-Gordon functional! For a 2,2-dinitrobiphenyl molecule, is the energy minima 45° as for biphenyl or is it replaced by the 90° minima? Probably somewhere in-between, but closer to 90° I suspect. Only a full-blown calculation can really decide. prof premraj pushpakaran writes — 2018 marks the 100th birth year of Derek Harold Richard Barton!!! Yes, indeed and the event is being celebrated at Imperial College on September 7th, 2018. See DOI 10.14469/hpc/3751 for more details of the Sir Derek Barton Centenary Symposium. 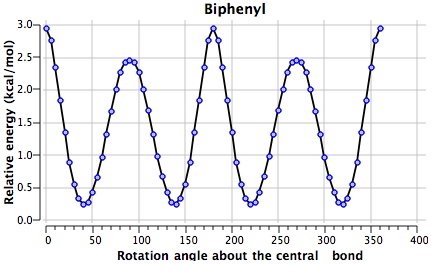 Conformational analysis of biphenyls: an upside-down view is licensed by Henry Rzepa under a Creative Commons Attribution-Noncommercial-Share Alike 3.0 United States License.